Create a darling presentation for tour christmas treats with ribbons and craft tags. For my final craft for the Sizzix Triple Play Blog Hop I decided to continue with my Christmas theme in celebration of a honored family tradition… chocolate cherries! 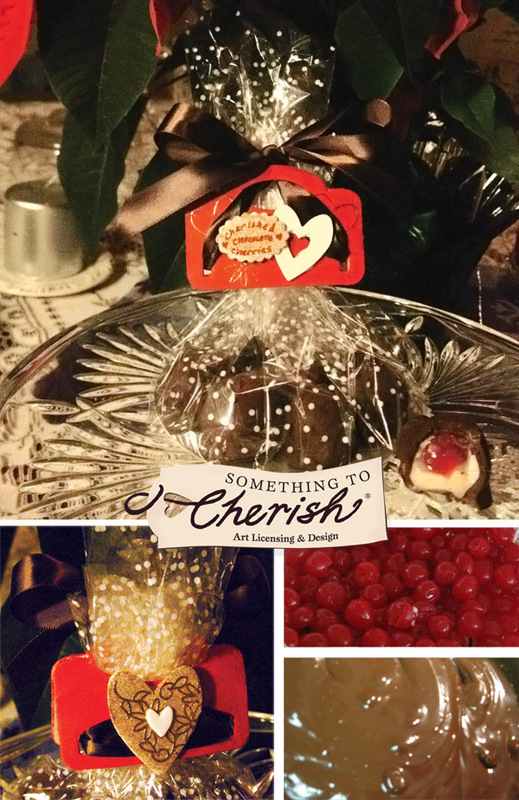 The Sizzix Treat Bag topper die designed by Eileen Hull for was the perfect opportunity to create a presentation for these delectable cherries that have been made in my family for generations. I put this topper together rather quickly with the help of Sakura‘s gold Sticklers and Plaid‘s Folk red and gold Art Extreme Glitter paint. Keeping with the chocolate theme, a silky brown ribbon bow pulls it all together. This project is great, thanks for posting it and participating in the FaveCrafts blog hop! Our next blog hop will be February 15 and we hope you’ll participate again. Your project will also be featured in a special newsletter that goes out to 850,000+ readers. Thanks again! Thanks for the feedback Julia. It was an honor to be asked to participate. I look forward to future hops! Like your take on using the die and how you embellished it! YUMMY! Your treat toppers turned out delicious as well… love ’em! Will miss seeing you next month – hope you both have a wonderful holiday!